The Scorpio is a household name in the Indian car market since the year 2002; the SUV has many accolades to its name including ‘Best car of the year’, ‘Best SUV of the year’ and much more. While the first generation SUV was introduced back in 2002, the second generation was introduced just after four years in 2006. Much later Mahindra decided to up their game and introduced the third-generation SUV back in 2014. Now after almost threeyears of its production Mahindra has decided to launch the facelift variant of the SUV. 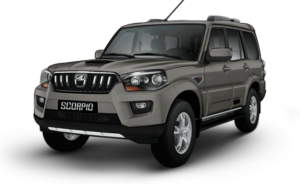 Mahindra Scorpio Ex Showroom Price in New delhi ranges from 9,29,774/- (Scorpio Getaway BSIV 2WD) to 15,44,417/- (Scorpio Adventure Limited Edition 4WD) .Mahindra Scorpio has 12 Variants of Diesel are available in India. Mahindra Scorpio comes in 8 colours, namely Molten Red,Getaway Rocky Beige,Fiery Black,Getaway Fiery Black,Getaway Mist Silver,Diamond White,Mist Silver,Adventure Edition White. Mahindra Scorpio comes with MHawk 4 Cylinder Engine Variable Geometry Turbocharger With Intercooler 4 Valves Per Cylinder C with 2179 CC Displacement and 4 Cylinders with Maximum Power 120 bhp@4000 rpm and Peak Torque 280 Nm@1800-2800 rpm DRIVE TRAIN 2WD and reaches 100 KMPH at N/A . Mahindra Scorpio comes with Automatic Transmission with 2WD.